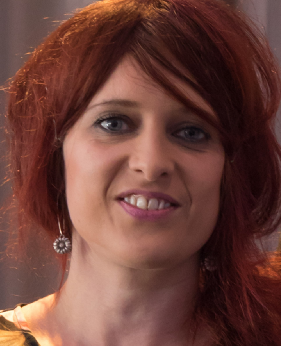 On Thursday, Manchester Evening News social affairs editor Jennifer Williams learnt her work on uncovering the uncounted homeless deaths in Greater Manchester was to be singled out for praise by Labour leader Jeremy Corbyn during a speech in which he called for more support for public interest journalism. WADING back into the debate on the British press is probably not the smartest thing I’ll do this weekend, but as it happens this is an article I’ve wanted to write for a while. I will come to some of the legitimate criticisms of the British media in a minute, but first to the thing that’s scaring me. There has been something troubling happening in this country for some time, something politicians have not been slow to exploit. Increasingly a narrative is taking hold that, as an industry, journalists are either liars or elitists who all came from the same public school cabal. Or both. That we all work for ‘right wing media moguls’. Or that journalism is ‘rigged’ for the ‘privileged’. And, from whichever side of the political spectrum you come at it, what we write or broadcast is not to be trusted. 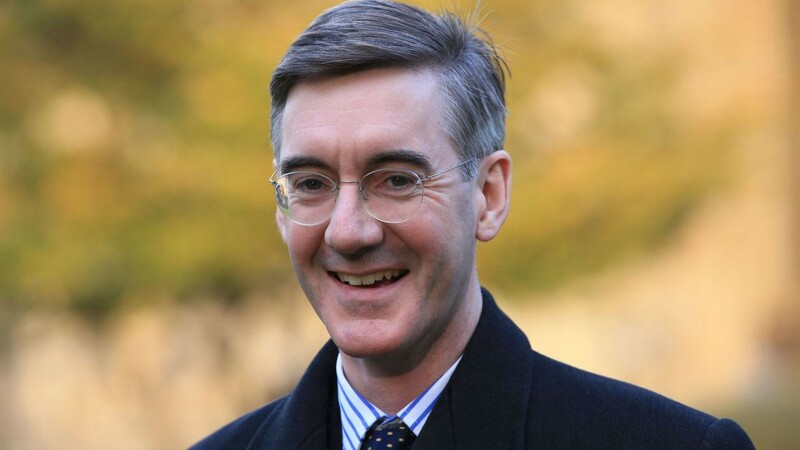 In a country bubbling with anger and frustration, be it due to the EU referendum, growing generational, regional and economic divides, the economic crash or the austerity that followed it, it is unsurprising that the more this narrative is pushed forward, the more it is taking hold. Politicians have recognised this for a while. 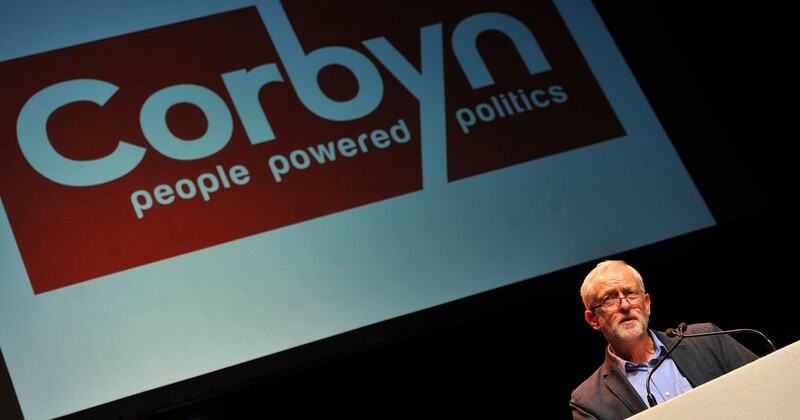 Two years ago, when Jeremy Corbyn held a huge leadership rally in Salford during his second leadership campaign, it was already in evidence. I listened while Corbyn told the crowd, sarcastically, how a significant Labour victory against UKIP a few days earlier had been ignored by the media. In response the faithful knowingly cheered this in-joke, in a shared understanding of a press that is deliberately not doing its job. Yet that victory turned out to be a narrow parish council by-election win in Ramsgate which, in fact, had indeed been covered. It had not been front page news, or probably even on the bulletins. Obviously. Because it was a narrow parish council by-election win. But it was a useful, unifying tactic, one that helped to cement the belief that the media are crooks, while stoking an us-versus-them narrative. Less than a year later, during the 2017 general election, Corbyn was back in Salford. This time I watched while Laura Kuenssberg prepared to do a piece to camera outside Shopping City, as people in the crowd — presumably Corbyn fans — continually shouted abuse at her. In April 2018, I went to another Corbyn rally here. This time it was the launch of the party’s local election campaign in Trafford. There were about half a dozen journalists there: me, the Mirror, the Guardian, the Financial Times, ITV, the BBC and, I think, the Press Association. None of these are right-wing institutions and indeed two of them are determinedly left-leaning. But as journalists got up to ask perfectly legitimate questions of Corbyn I heard hissing behind me. 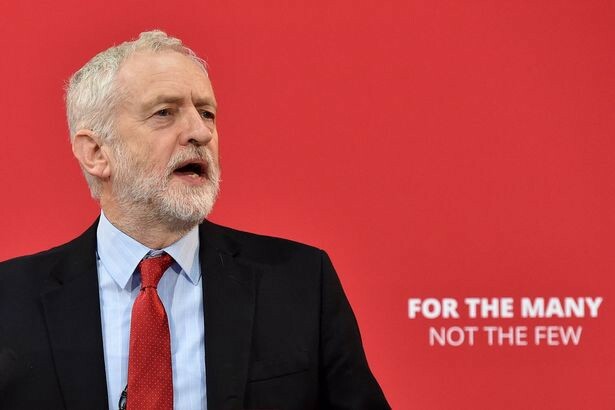 That hissing was not slapped down either from the platform or by anyone in the crowd, suggesting to me that, within the Labour party, this is increasingly both tacitly and socially acceptable — or at least not so unacceptable that anything needs saying. At this point in the article, doubtless someone will wade in on Twitter and call me a thin-skinned snowflake. Diddums. Yet there are direct parallels here — in terms of the political techniques and their results — to the United States. ‘Crooked media’ there, ‘rigged journalism’ here. Fake news there become fake news here. It’s not just Corbynites, of course. This weekend, when Chuka Umunna dismissed stories suggesting he was setting up a new party, he didn’t just write it off as silly season speculation or people briefing against him, but instead labelled it ‘false news’. I also spent a grimly satisfying few minutes Googling various ministers and senior Tories this afternoon to see how often they’d gone down the Trump route. The now-Brexit secretary Dominic Raab accused — in a somewhat unlikely move — the trade magazine Inside Housing, not well-known for its sensationalist lies, of fake news six months ago. 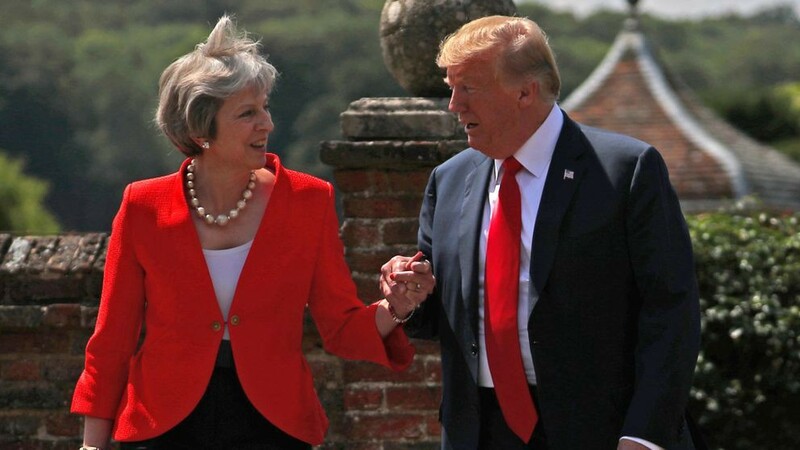 And, indeed, Theresa May was silent as Trump stood next to her last month and said the Sun’s interview with him was fake news, when they had literally already released the recording to the whole world. Drip, drip, drip. Language matters. “If thought corrupts language, language can also corrupt thought. A bad usage can spread by tradition and imitation even among people who should and do know better,” wrote George Orwell of political rhetoric, a year after World War Two ended. n the US, of course, journalists are now being killed; bomb threats sent to newspaper offices. One argument often put forward when I try to warn of the dangers around the anti-press narrative is ‘you’re different, you’re a regional journalist’. Yet the sweeping generalisations about the British press affect all journalists, as the examples above hopefully demonstrate. The narrative undermines an entire institution that plays far more of a part in British society than many people realise. Most journalists are spending their time endlessly checking things to see if they’re right, trying to find out what actually happened, why, and what the implications are. In the case of political journalism, most of us are trying to work out what politicians are saying or doing, and why. And what the implications are. For a functioning democracy that is essential. It is also essential that people do not assume we are lying to them — even if we don’t always get it right and even if, sometimes, those truths may be uncomfortable for the politicians either in power or hoping to get there. So, to the legitimate criticisms of the press. The British media is far from perfect. From a Labour perspective it’s perfectly correct to say that more traditional Fleet Street titles lean to the right than to the left and, yes, two of them are owned by a media mogul with considerable political influence. It’s also worth noting, though, that the best-read paper in the country is actually the non-partisan Metro. Most journalistic output in this country does not stem from right-leaning mogul-owned newspapers. Is there a bit too much focus on commentary rather than reporting facts? To my mind, yes (she says while writing a comment piece nobody really asked for). A personal bugbear of mine has also long been the determined London-centricity of the national media, a situation that could — and perhaps will — be rectified in a whole number of ways, not least by more organisations following the example of the BBC to set up more major arms outside of the capital. Finally, is journalism a white middle-class profession? Yes. Journalism’s white middle-classed-ness holds up a mirror to the lack of social mobility in this country. There is definitely more the industry could and should do to recruit and promote from a range of backgrounds. All legitimate criticisms. All need to be aired. 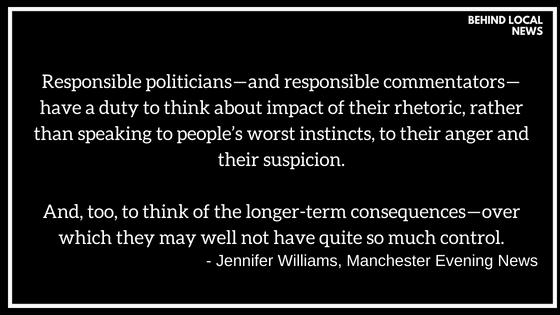 But responsible politicians — and responsible commentators — also have a duty to think about impact of their rhetoric, rather than speaking to people’s worst instincts, to their anger and their suspicion. And, too, to think of the longer-term consequences — over which they may well not have quite so much control.